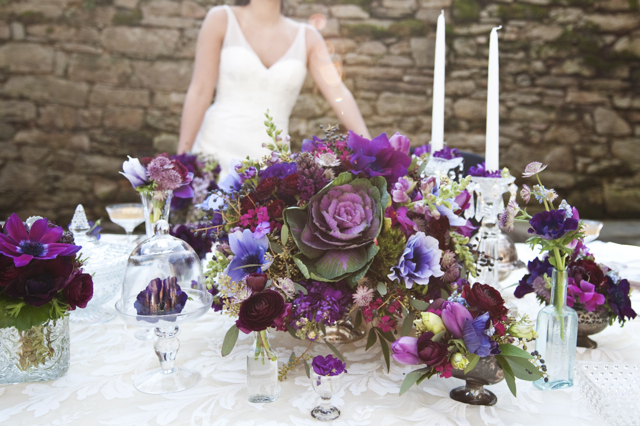 In this gallery you will find some lovely ways to decorate your reception tables. 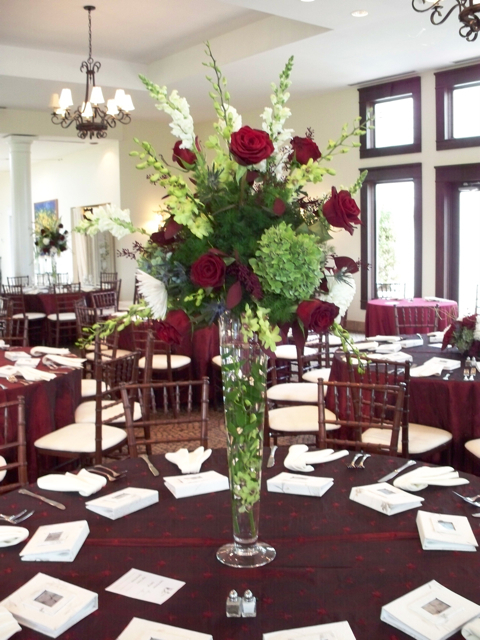 We enjoy creating different styles of centerpieces, so the designs will range from vintage to modern, but each arrangement was carefully designed for our bride of the day. Photograph by Julie Renee. 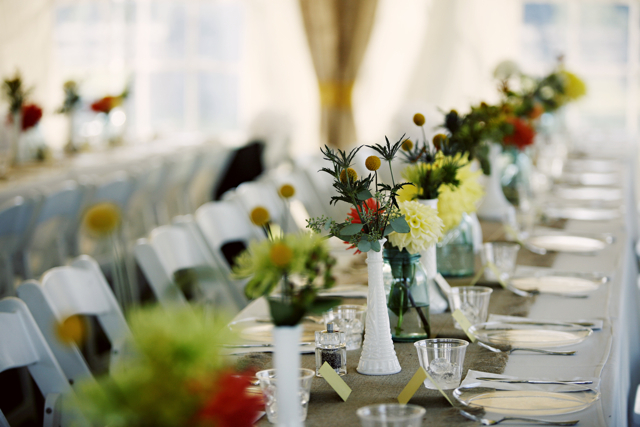 Simple bud vases were used to enhance the beauty of this long table. We call this style of seating king tables. Large elevated designs also were used to finish the look of this table. Photograph by Kim Seidl. Elevated designs make a room fell totally full and lush. They bring drama and height to a space. This design was elevated on our wooden stands. 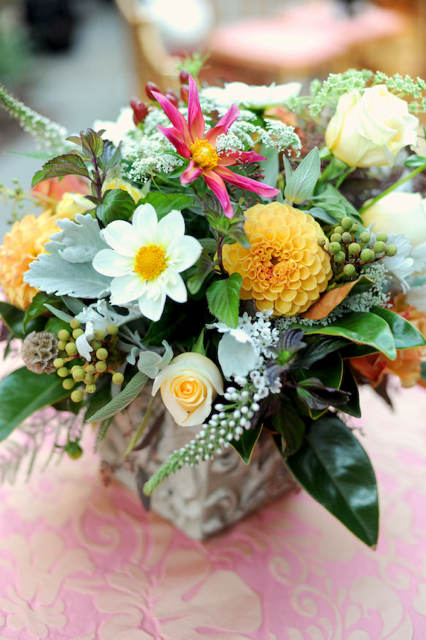 We used dahlias, zinnias, antique cream hydrangea, solidago, scabiosa pods, green dianthus, yarrow, seeded euc, sea star fern, snapdragons, green caabbage roses, and spray roses in these designs. Photography by Kim Seidl. 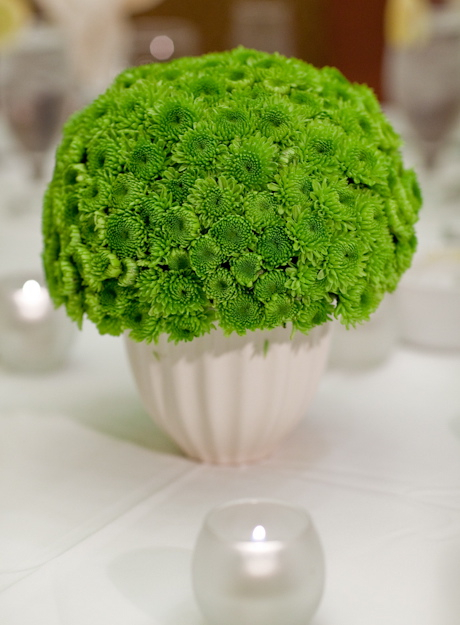 Green button mums were used to create a tight clean mound of flowers. 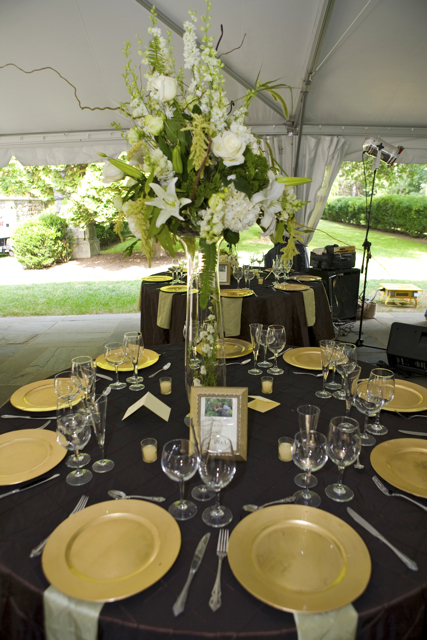 This centerpiece was photographed by the Observatory. 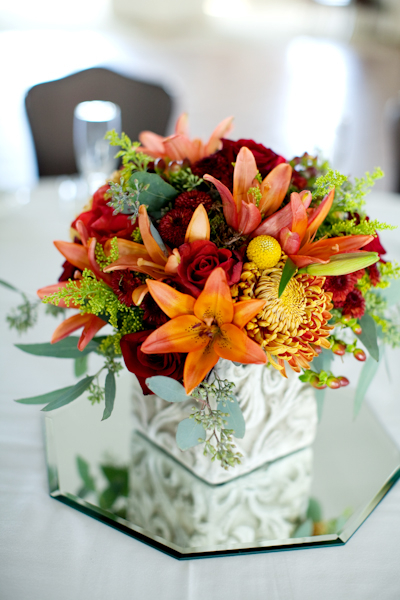 Orange lily, yellow billy balls, bronze football mums, red hypericum berry, red roses, seeded euc, burg berry, and yellow solidago were designed in a stone urn. Photography by Genevieve Leiper. Local dahlias designed in a mason jar. Photography by Kate Headley. 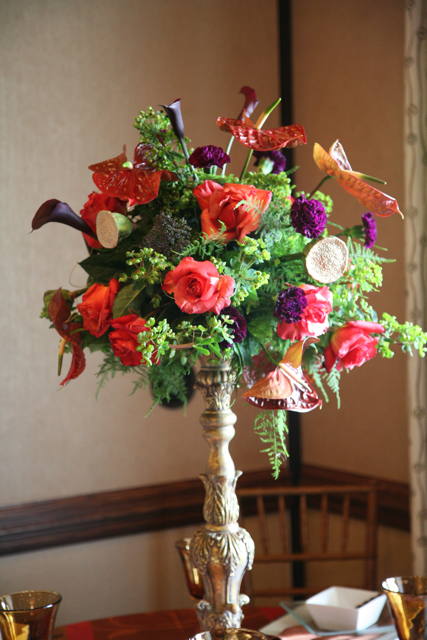 A design of orange dahlias, purple lizzy, circus roses, seeded euc, orange roses, orange tulips, and hanging armaranthus. We used vintage scales to display the designs. 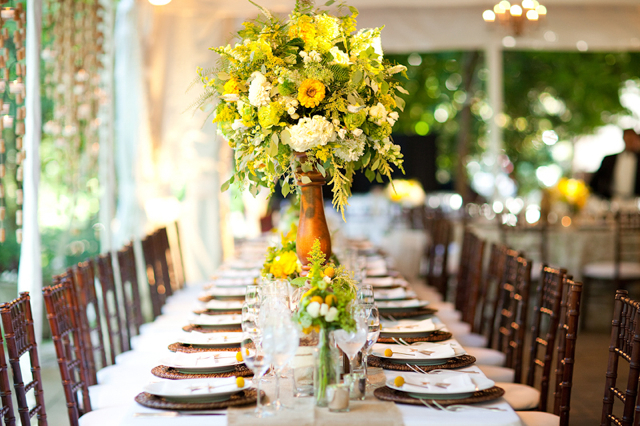 This wedding was featured in Washingtonian Magazine. Photography by Genevieve Leiper. Yellow tulips, green button mums, gloriosa lily, alchemilia, green hypericum berry, hot pink stock, pink mokara orchids, and purple pholox. Fun little trick these were actually the maids bouquets being disguised by the vase. This centerpiece/bouquet can be made in all season excluding the tulips which are only available until early June and then again in the fall. Photography by the Obeservatory. Vases can be wrapped in moss for a unique and organic look. 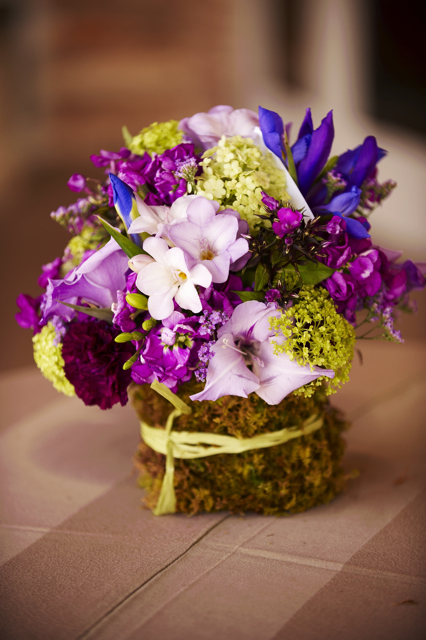 We used lavender freesia, purple stock, green viburnum, purple iris, and gladiola blooms to create this piece. Photography by Joylyn Hannahs. This design was elevated on a glass stand. 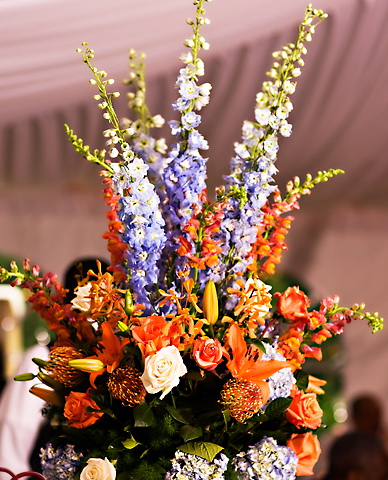 We used orange roses, blue hydrangea, blue delphinium, orange pin cushions, orange snapdragons, orange lily, and cream roses to make this design. 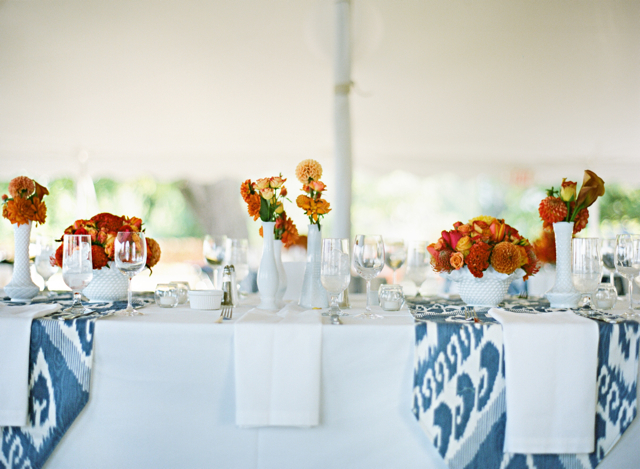 The couple graduated from UVA and chose to use their school colors as a theme for their flowers. Photography by Photo Fanatic. 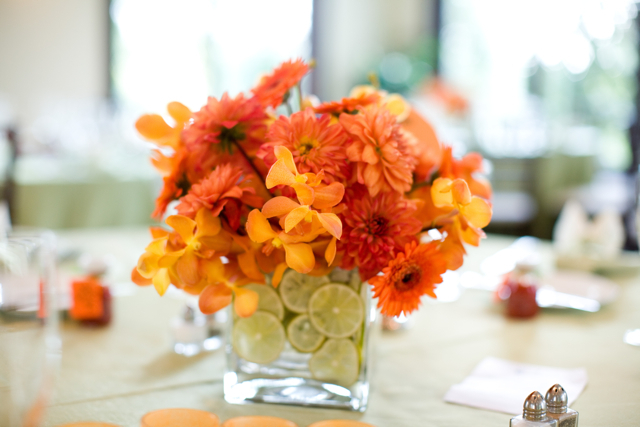 Orange mokara orchids, orange gerber daisies, and orange dahlias were used to create this design. This is an awesome look but one that is hard to create and you better have a professional slicer to get that fruit ready. A second glass vase is inside of the larger vase pushing the limes against the outer glass vase. Simply lovely, but it does require a lot of labor. 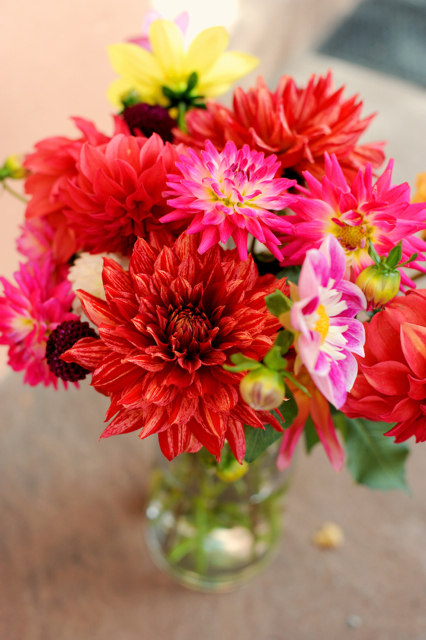 This is perfect for all seasons but was designed in the Fall because of the dahlias. Photography by Amy Martin. 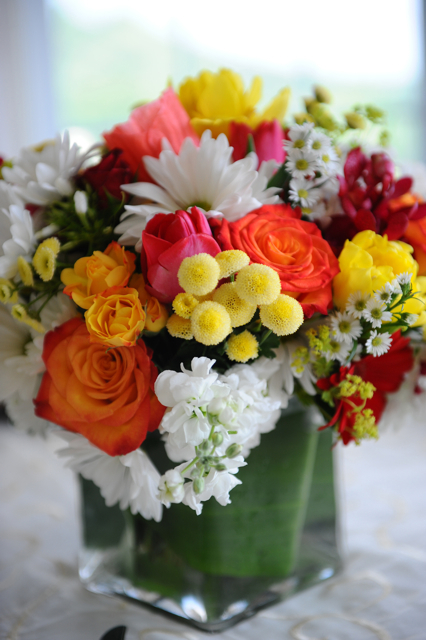 White daisy, white stock, circus roses, yellow tansy, red tulips, red orchids, white aster, red gerbers and white phlox made up this lovely bright and happy centerpiece. The vase was lined with a green aspidistra leaf. Photography by Jennifer Anderson. 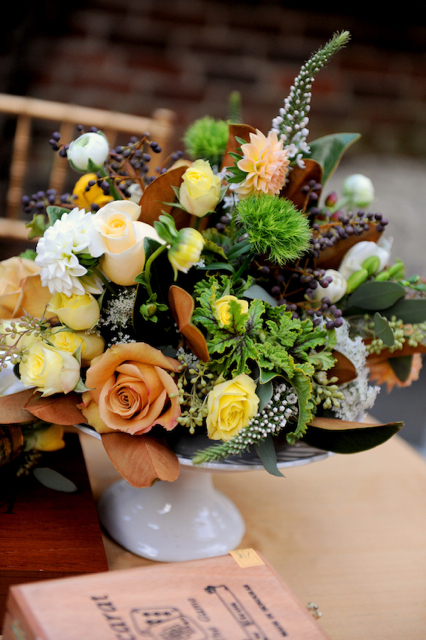 Orange roses, dahlias, pin cushions, freesia, crocosmia, spray roses and callas in vintage milk glass. Photography by Anne Robert. This table was featured on Style Me Pretty. Antique green hydrangea, with orange roses, purple carnations and purple orchids, bronze toned mums, purple dahlias, and orange snapdragons. This was elevated on an iron stand with draping crystals. This wedding featured on the Weddings Unveiled blog. Photography b Laura Ashbrook. 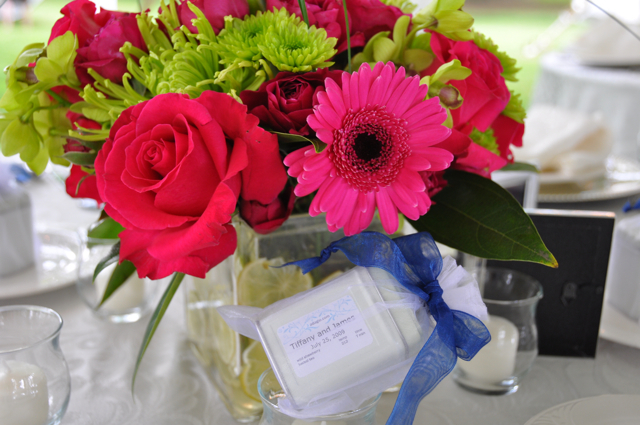 This table was created with vintage milk glass vases and blue mason jars. We used dahlias, billy balls, blue thistle, football mums, and seeded euc to create this table. 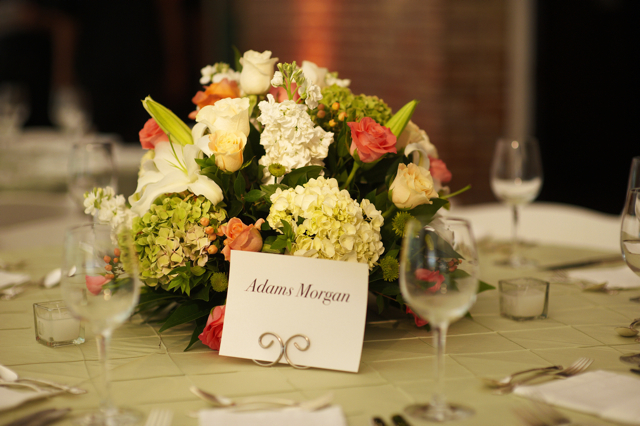 This table was featured in Washingtonian Magazine Bride and Groom. Photography by Love, Life, Images. This centerpiece was created with creme de la creme roses, dahlias, seeded euc, white gooseneck loosestrife, privet berry, spray roses, white stock, scabiosa pods, queen annes lace, mint, and magnolia. This design was created in the fall and was featured on several blogs. Photography by Kate Headley. 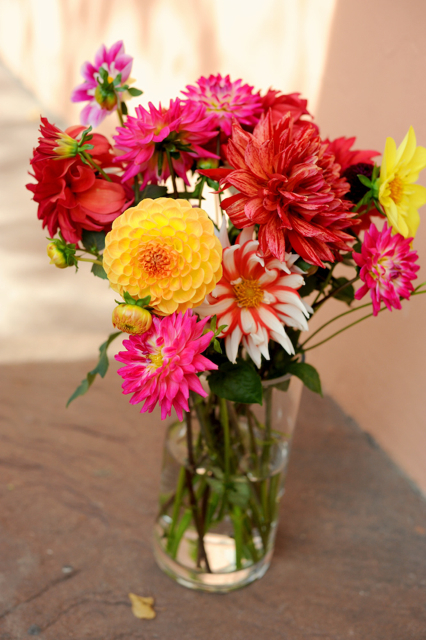 Dahlias presented in a simple vase. Photography by Kate Headley. 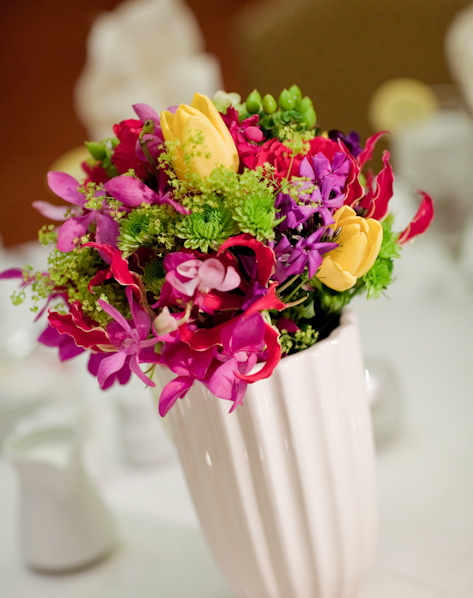 This centerpiece was created with green spider mums, green button mums, hot pink roses, green spider mums, orchids and hot pink spray roses. The design was presented in a square glass cube. 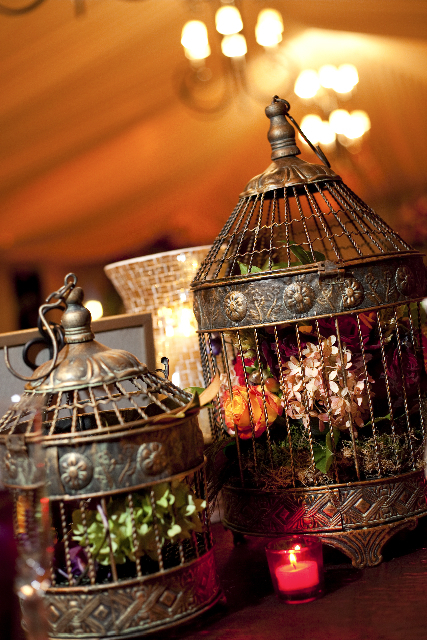 Brass lanterns were used to create a unique centerpiece. Hydrangea, roses, orchids, carnations and dahlias were placed inside the cage. Photography by Laura Ashbrook. 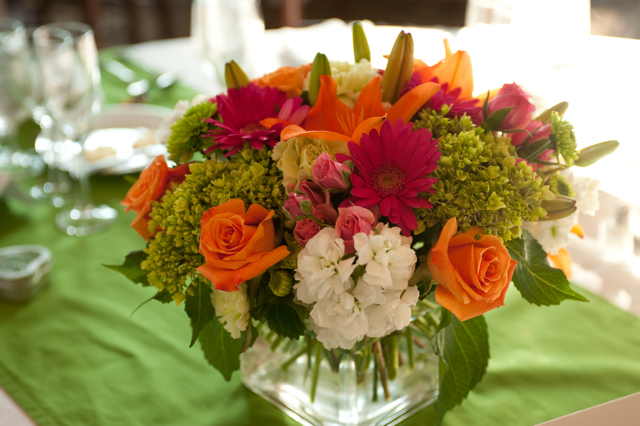 Green hydrangea, pink spray roses, orange roses, hot pink gerbers, orange lily, white stock, green button mums and green carnations made up this centerpiece. A design of scabiosa pods, looped bear grass, orange lily, hot pink roses, green button mums, pink orchids and orange pincushions was designed in custom made pottery. 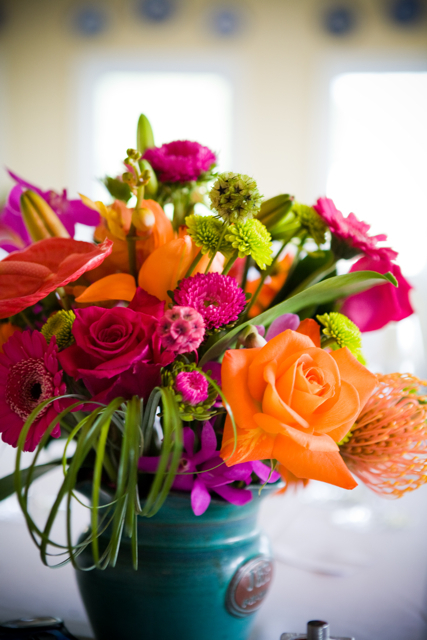 This design was created with orange lily, green spider mums, green hydrangea, orange spray roses, orange and pink roses, pink spray roses and hot pink orchids. The design was elevated on a glass pilsner vase. Photography by Genevieve Leiper. 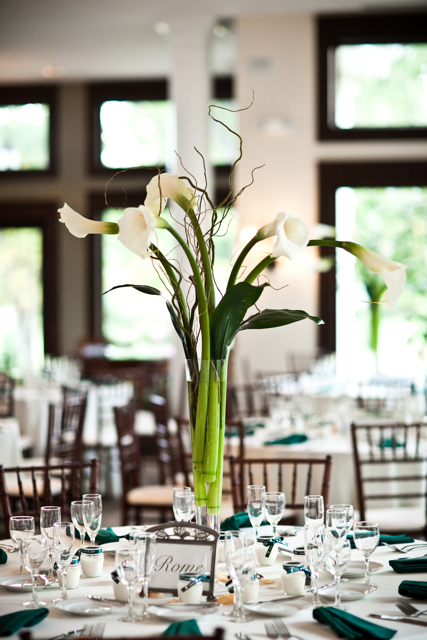 White callas were mixed with willow branches and aspidistra leaves. Photography by Paul Morse. 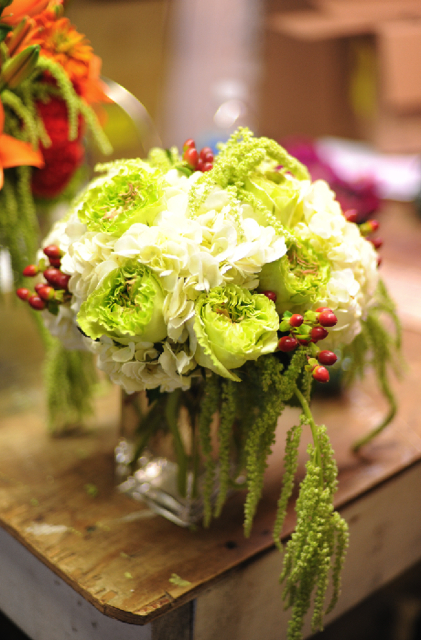 Antique green hydrangea was used with black magic roses, white spider mums, blue thistle and willow. 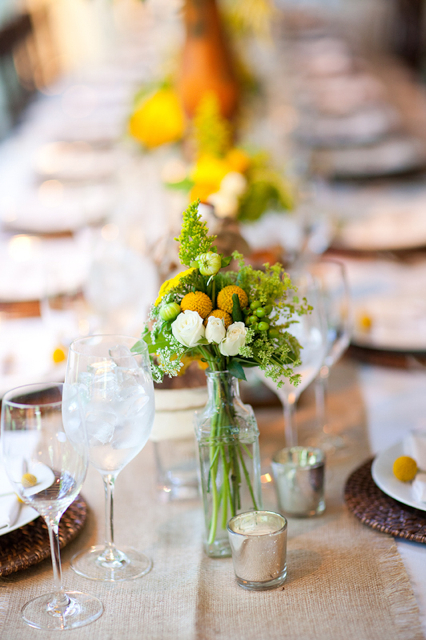 A charming table was set by using vintage milk glass vases, with antique mason jars. We used dahlias, seeded euc, billy balls and berry to create these pieces. 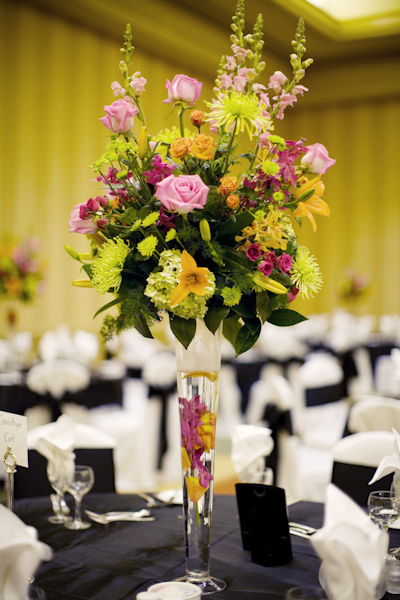 Pilsner vases with submerged orchids and petals, were used to elevate green spider mums, pink roses, pink snapdragons, orange lily, orange and pink spray roses, green hydrangea and orange orchids. Photograhy by Genevieve Leiper. 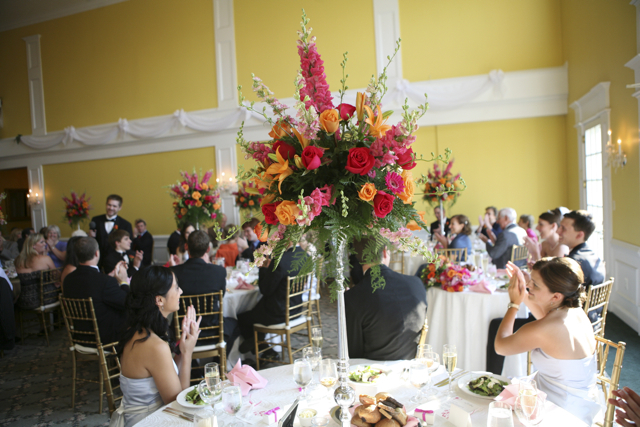 Hot pink roses, orange roses, orange lily, pink snapdragons, pink larkspur and plumosa grass were elevated on silver stands. Photography by Michael Bonfigli. 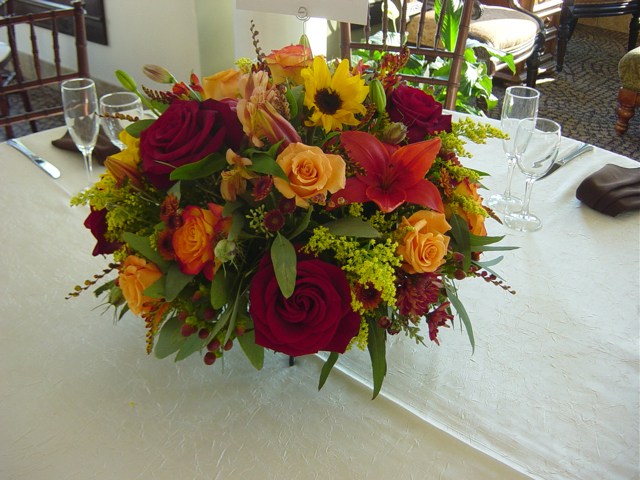 Sunflowers, orange lily, solidago, orange roses, black magic roses, circus roses, hypericum berry, crocosmia pods and seeded euc were used to create this low centerpiece. 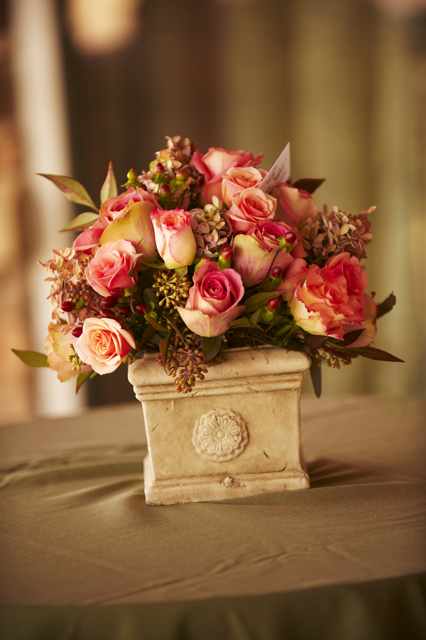 Pink mocha roses mixed with pee gee hydrangea, nandina foliages, hypericum berry, and seeded ecu in a stone urn. Photography by Joylyn Hannahs. 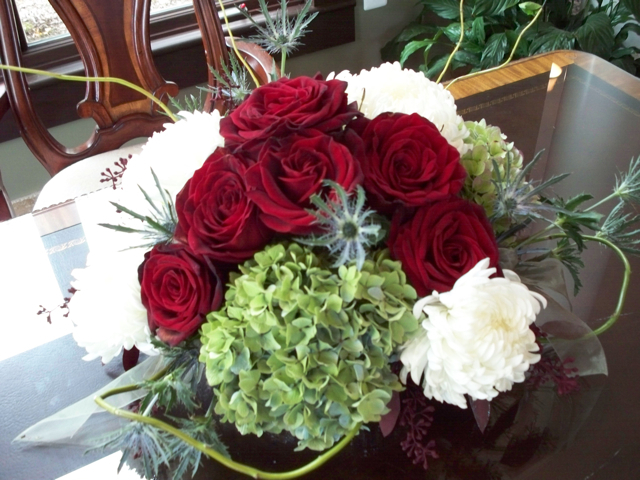 This centerpiece was on its way to a wedding, it was created with green cabbage roses, cream hydrangea, red hypericum berry, and green amaranthus. Photography by Kate Headley. 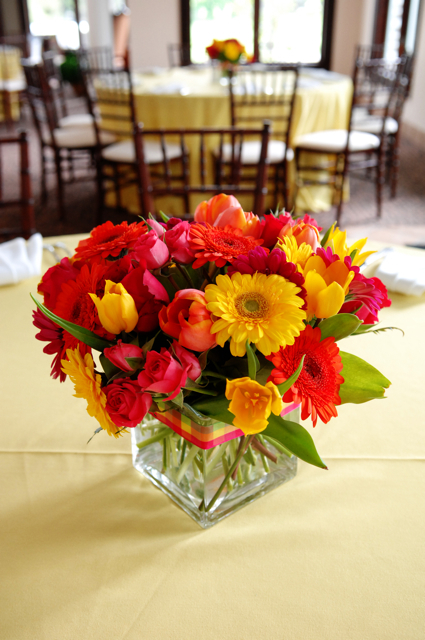 This centerpiece was created with yellow and orange gerber daisies, hot pink roses, yellow and orange tulips and dark green leaves. The flowers were designed in a square glass vase. 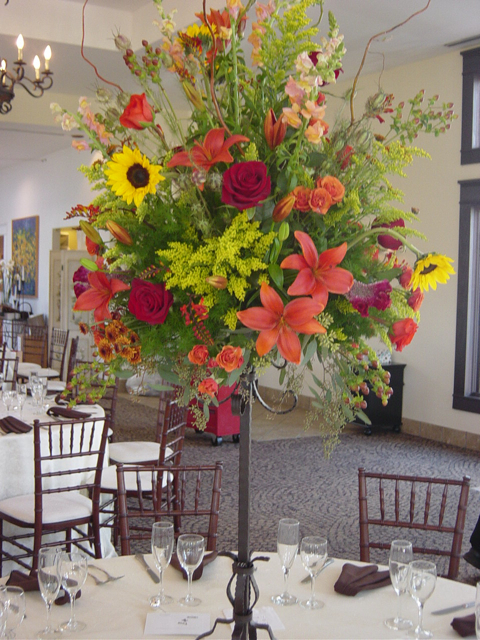 Orange lily, sunflowers, black magic roses, orange spray roses, solidago, seeded euc and willow were used to create these tall centerpieces that were elevated on iron stands. 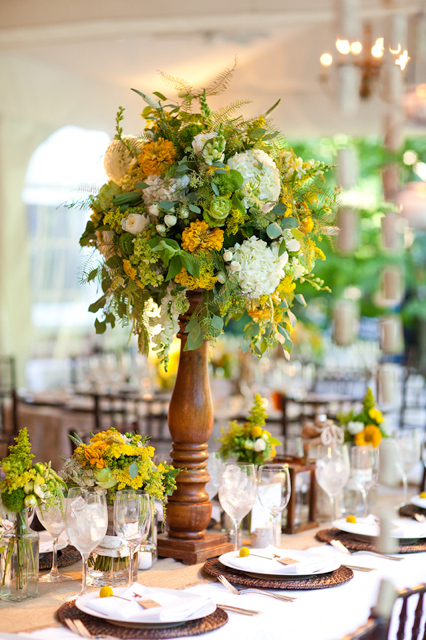 Fiddle head fern, willow, white lily, white stock, white roses, hanging green amaranthus and white hydrangea were elevated on hurricane glass vases. 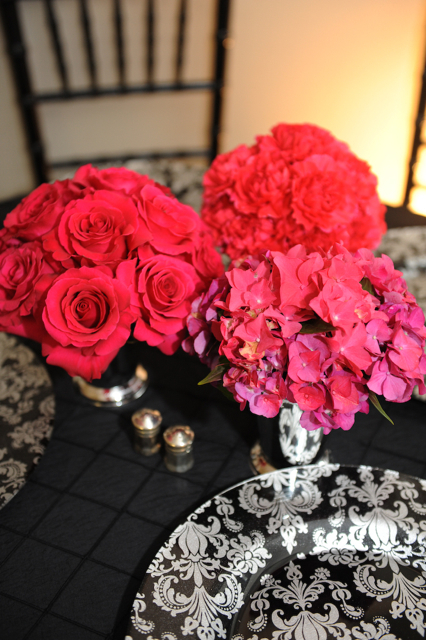 Grouping centerpieces together is a fabulous look, here we used hot pink roses, hot pink carnations, and hot pink hydrangea, each displayed in their own vessel. Photography by Kate Headley. 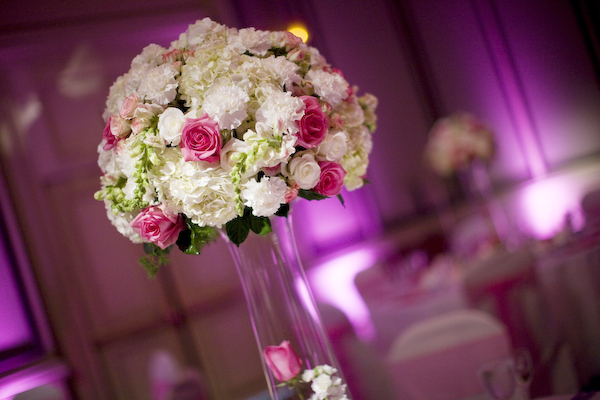 White hydrangea, white stock, white roses, pink roses, electra spray roses, white carnations and white snapdragons were elevated on glass hurricane shaped vases. Flowers were submerged in base of vase. Photography by Genevieve Leiper. Sweet and simple designs can be created for the cocktail hour. 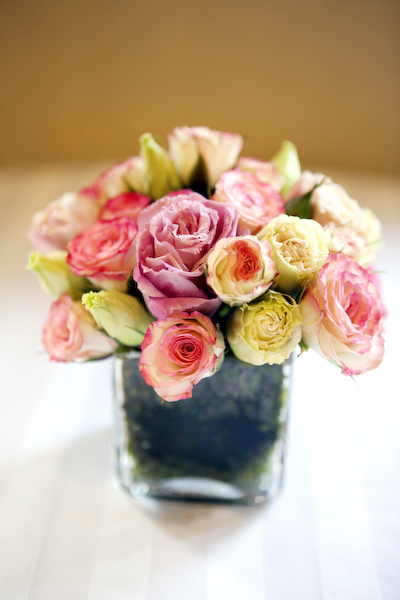 We used pink lizzy, and electra spray roses in moss lined vases. Photography by the Regeti’s. An eclectic mix of vases was used to create this grouping. 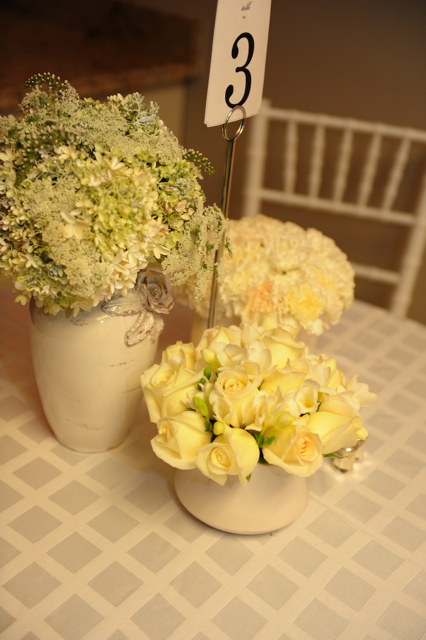 The tallest white vase held white hydrangea and queen anne’s lace, white and cream carnations were displayed in a small white pitcher and the final design was in a white jug, with white roses and white freesia. Photography by Kate Headley. Green hydrangea, was mixed with black magic roses, white and green dendrobium orchids, blue thistle, seeded euc, white mums and white snapdragons. The designs were elevated on silver stands. White football mums, were mixed with green hydrangea, blue thistle, black magic roses, red seeded euc and willow branches. 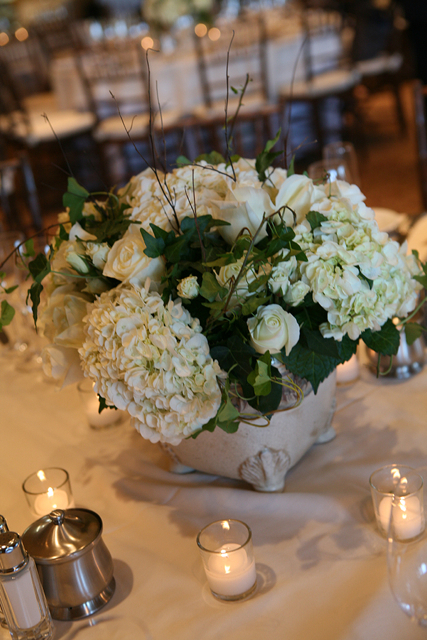 White hydrangea, white roses, white spray roese and white lizz were mixed with green ivy in a stone urn. Photography by Kristen Gardner. 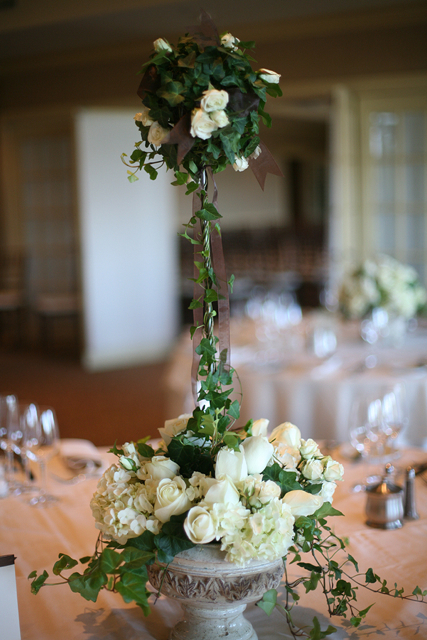 We created an ivy topiary with white roses, white spray roses and white hydrangea. Photography by Kristen Gardner. 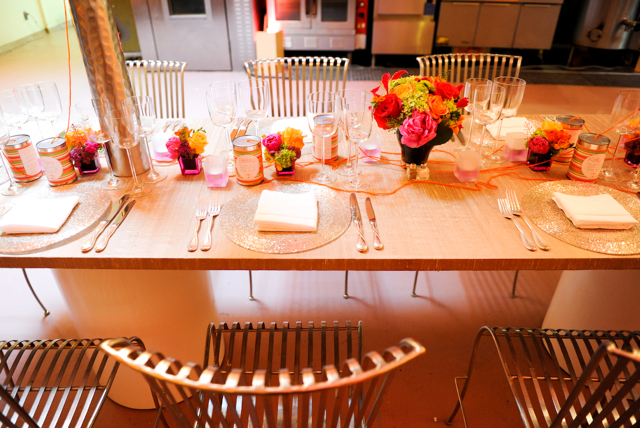 Small clusters of bright flowers were used to create a fun centerpiece for this social event. Photgraphy by Kate Headley. 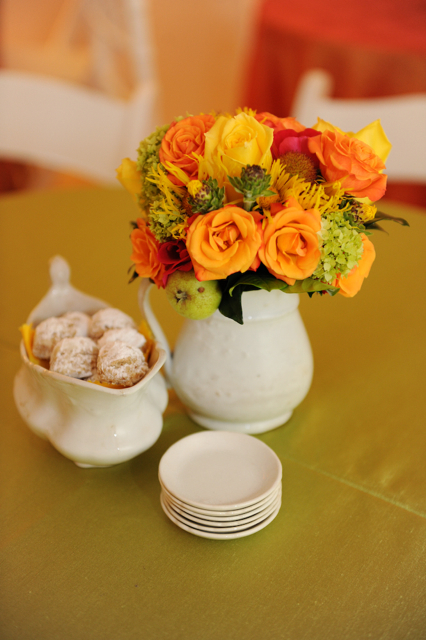 Vintage pitchers and sugar bowls, and butter plates were used with orange and yellow roses, mini apples, green hydrangea and herbs from the garden. Photography by Kate Headley. 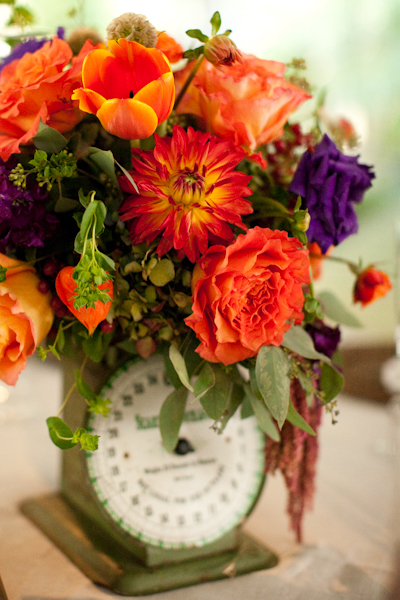 Vintage scales were used to lift this very fun centerpiece that features dahlias, lizzy, roses, hydrangea, tulips, scabiosa pods, seeded euc, and hanging amaranthus. Photography by Genevieve Leiper. 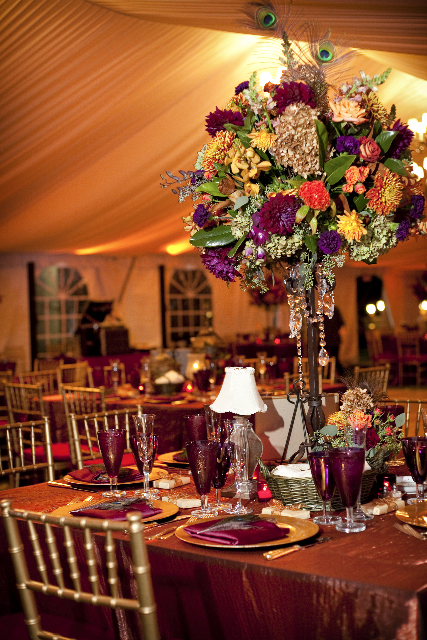 Purple mini callas, orange milva roses, deep red anthurium, hydrangea, dark purple carnations, dogs eye euphorbia, and fern were elevated on gold pedastools. Photography by Joylyn Hannahs. 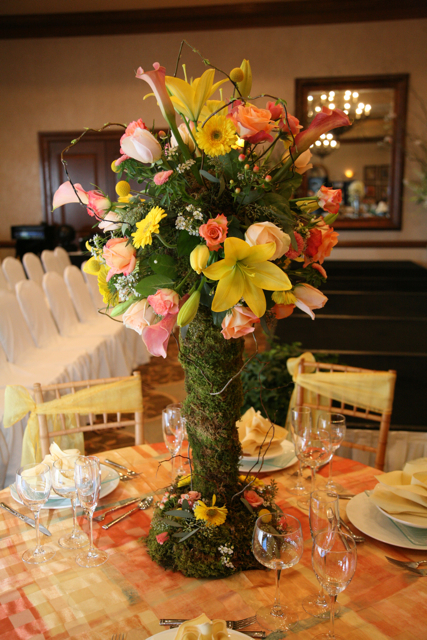 A moss stand was created to elevate this floral of yellow lily, yellow gerbers, peach roses, peach callas, twig, seeded euc, yellow billy balls, and tulips. Photography by Joylynn Hannahs. 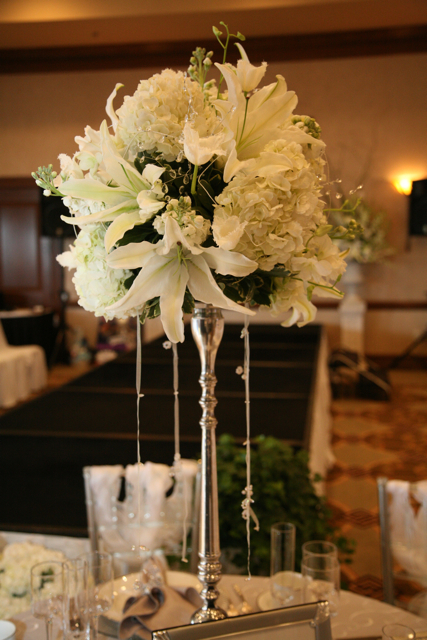 White lily, white hydrangea, white roses, white stock and white tulips were elevated on a silver crystal stand. Streamers of ribbon and crystals completed the design. Photography by Joylyn Hannans. White hydrangea, white roses, dark purple carnations, lavender stock , lavender phlox, were combined with lavender tulips in a square glass vase. 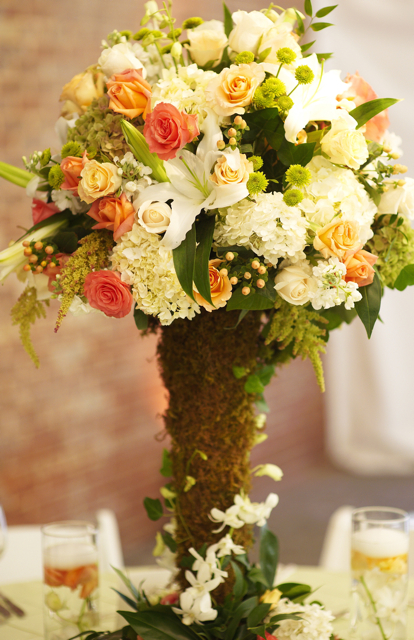 Our moss stands were used to elevate cream hydrangea, coral roses, white lily, white roses, peach roses, white stock, hanging amaranthus, peach hypericum and white dendrobium orchids. Photography by Regeti’s. 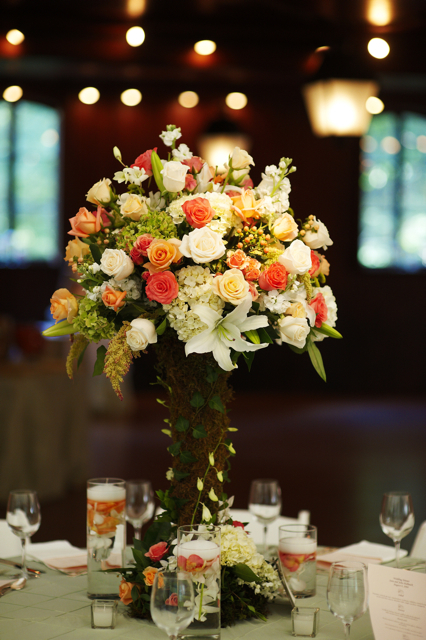 Elevated on a moss stand of white orchids, we displayed white lily, peach roses, deep coral roses, peach hypericum berry, white and green hydrangea, and green button mums. This wedding was featured in Engaged Magazine. Photography by the Regeti’s. 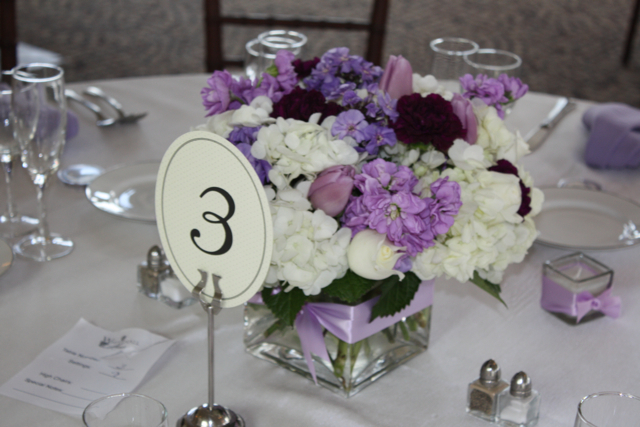 Lavender roses, purple carnations, blue iris, and purple stock were pulled through white hydrangea. This was designed in a square glass vase. 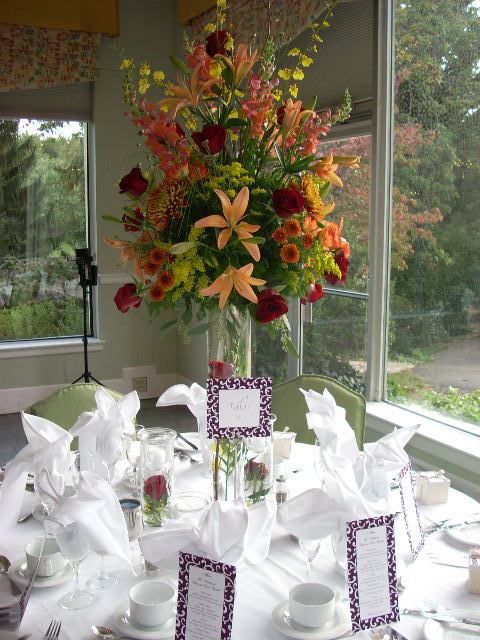 Orange lily, orange snapdragons, yellow solidago, dark red roses, bronze mums, and yellow orchids were displayed on glass cylinders.